Everyone is getting in on the pre-Black Friday bundles and deals to conveniently coincide with the launch of Call of Duty: Infinite Warfare. 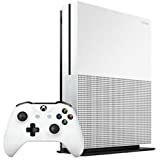 Late yesterday, Microsoft one-upped Sony’s PS4 deal by announcing a temping new Xbox One S promotion, that gives would-be buyers a choice of a free game (including Call of Duty: Infinite Warfare) when they pick up any Xbox One S at participating retailers. Deals start at $299, so if you’re looking for an Xbox One S Battlefield 1 Bundle or an Xbox One S Gears of War 4 Bundle and want to pick up another other high profile new releases, feel free. Check out the product page at Amazon right here. The deal runs from today through November 12th. Head on over to the official Xbox Wire site for the announcement.